Obfuscate is not a word you think you will hear very often at a coffee shop. Not true in my case. One of my regular haunts is a local Loveland restaurant and coffee shop. A group of men meet there every Wednesday. They have been in town a long time, and include a pastor, a former high school coach and athletic director and a doctor. Occasionally, I sit in on their in-depth conversations but mostly, my laptop and I sit at a nearby table—the one by the electrical outlet. The other day, as I typed way, I couldn’t help but bits of their conversation. The word obfuscate came up a few times. I decided I needed to know for sure what this word means. Obfuscate means to hide the intended meaning of communications. To becloud it, if you will. It can also mean to confuse, bewilder or stupefy. Additionally, synonyms are muddle, cloud and perplex. A lesser meaning is to darken. 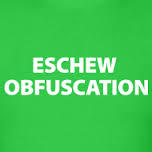 That is because the word obfuscate comes from Latin obfuscates, the past participle of obfuscare. This means to darken.